When life gets busy, many people have a bad habit of ignoring their health. September is National Cholesterol Month. This month also celebrates World Heart Day on September 29, which means it may be a good time to examine the health of our bodies. Cholesterol is often termed as both “good” and “bad.” Defined “good cholesterol” is high-density lipoprotein (HDL) and “bad cholesterol” is low-density lipoprotein (LDL). Cholesterol levels are directly tied to heart health. According to the Centers for Disease Control and Prevention, nearly 37 percent of adults in the United States exhibited LDL levels that put them at high risk for heart disease and stroke. Doctors tell us we need to consume good, “heart-healthy” cholesterol but stay away from cholesterol that will raise our levels of bad cholesterol. But that advice is often confusing, and we tend to ignore it and still eat as we normally would. So how can people lower cholesterol levels and keep their hearts healthy? While most people think diet is the key to lowering cholesterol, regular exercise plays just as important a role. The American Heart Association recommends that seniors engage in 30 minutes of moderate-intensity exercise five times a week. Low-impact exercises, such as water-aerobics and elliptical exercise machines, elevate heart rates while limiting the chance of injury. Find a new favorite snack! It can be easy to be conscious of our food choices when sitting down to a meal, but when grabbing a quick snack, we often overlook the nutrition of the item. Hummus is an excellent substitute for dipping vegetables and chips in compared to higher calorie dip options, and there are numerous flavors to choose from. There is even a chocolate hummus for the sweet lovers out there! If you are in a rush, almonds pack both protein and healthy fats. 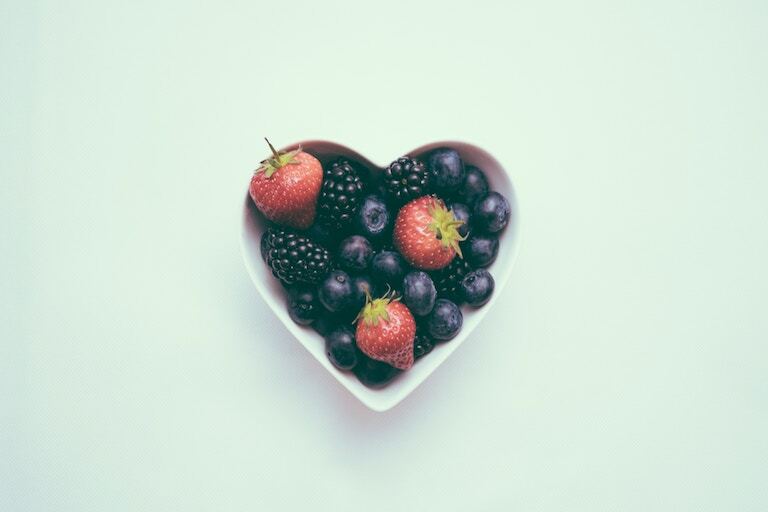 Heart-healthy food is both convenient and tasty. Take some time to find a snack that is enjoyable for you. While you can implement all these tips alone, it will be easier and a lot more fun to bring a friend along with you. You will both benefit from having a healthier lifestyle, and having someone to hold you accountable means this won’t be just a one time change but a whole new lifestyle! Make sure to have intentional days set to meet with your heart buddy and ways to touch base with them during the week to hold yourselves accountable. While stress hasn’t been proven to increase cholesterol levels, it can directly affect your heart health. While it would be easy to say “eliminate stress from your life,” that’s not always realistic. Instead find ways to bring more joy and laughter into your life. Go out with friends regularly, or find a comedian who you can watch. Remember to laugh at yourself and the situations you are in. Dwelling on the negative in life will only increase your stress. It can be hard to admit that we may need a little extra help. If you have implemented lifestyle changes and still encountering health problems, consult a trusted physician and talk to him or her about what the next step in listening to your heart may be. It may seem tricky to implement lifestyle changes. Try to do it slowly overtime. If we listen to our bodies, it will bring about positive changes to our health. Caring for our well-being and bodily health is crucial if we want to continue to thrive. So take a moment and listen to your heart.